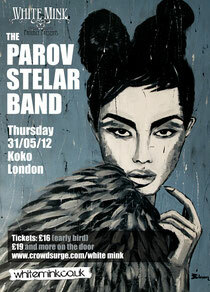 Parov Stelar, the pioneer-come-king of Electro-Swing music and quite possibly the hippest man on the scene right now, has just revealed that on the 31st May 2012 he’ll be descending upon London with his full live band, to move, groove and shake what is, unequivocally, one of the coolest venues in the Capital – Camden’s KOKO! Having played proud and worthy host to some of the biggest names in music over the decades – Coldplay, Madonna, Prince, The Clash and Tina Turner to name just a few – KOKO is literally dripping in both history and prestige, and will provide the setting for Parov to showcase his unique brand of eclectic, fun-fuelled grooves to an audience of 1,500 hungry swingsters. Sold out tour dates across Europe are testament to the sheer appeal of Parov’s ingenious fusion of the very best in house, swing, jazz, pop, electro and everything in between. His productions and trademark sound – coupled with a live show that will knock even the most discerning club-goers for six – have cemented the Austrian maestro's reputation as ‘The Daddy’ of a genre that’s exploding before our very eyes. His eagerly awaited London debut – hosted by the capital’s own White Mink and the team behind the Electro Swing Club - may offer further proof to those already in the know, and education to those yet to experience his show-stopping antics.